Jesus is speaking to those scandalized by His Sabbath day restoration of the once-paralyzed limbs of a man unable to walk. To be set apart or holy for God is to be so focused on following Jesus that I am willing to ignore what the crowd or what my own internal preference for comfort say I should do. Jesus was so sold-out to glorifying God the Father that He “resolutely” went to Jerusalem, knowing what awaited Him there. He didn’t flinch. Jesus isn’t here saying that Christians should look for trouble. And “their cross” here doesn’t refer to the troubles, adversity, and pain to which every human being is subject because we live in this fallen, imperfect world. Taking up our crosses involves acknowledging the sin in us--both our sinful natures and the sins we commit because of those natures--and following Jesus as the only One Who can set us free from their power over us. Those who follow Jesus daily submit to the crucifixion of our old sinful selves so that the new creation Jesus died and rose to make us become can rise. We daily remember our baptisms as the time of our crucifixion and death so that can Christ can daily raise us up: “We were therefore buried with him through baptism into death in order that, just as Christ was raised from the dead through the glory of the Father, we too may live a new life” (Romans 6:4). The only way I can follow through on a life marked by humble acknowledgement of my need of Christ is, by the power of the Holy Spirit, to forget about the affirmations offered by the crowds or the comforts offered by the world so that I can follow Jesus Christ alone. This isn’t easy. I like to be liked. I don’t like disappointing or offending people. I want to fit in. On top of that, I’d like to be comfortable. But while some Christians may be comfortable, materially or socially, none of that is promised by Jesus. So often, the discouragement I feel over the lack of discernible “progress” in my spiritual life can be attributed to one simple thing: I’ve taken my eye off of Jesus. *Weird or different are two words that could readily translate the Bible’s term, holy. The best translation is probably set apart for God. This takes place early in Jesus’ earthly ministry, according to John. At the start of chapter 2, Jesus turns water into wine at the wedding in Cana. Then, He cleanses the temple of moneychangers. After that comes these verses. In verse 23, where we’re told that after Jesus performed signs, people believed in Him, just as earlier, the disciples believed in Him in light of the miracle at Cana. “But Jesus would not entrust himself to them, for he knew all people,” verse 24 says. The verb is a form of pisteuo, the same term routinely used in John’s gospel for believing faith. It’s the verb used by Jesus in John 3:16. The message is clear: Jesus doesn’t put His faith in human beings, because He knows all about we human beings. He knows that we’re fickle, unreliable, unworthy of trust. And even when human beings claim to trust in someone, that belief is subject to change, even when the One trusted is the foundational truth of the universe, Jesus (John 14:6). The human condition is such that we tend to break trusts, turn on others, change our minds. We’re not reliable in any ultimate sense. I know that I'm not. No human being, no thing, no idea, can be believed in to make us whole, happy, sane, forgiven, purposeful. At least not over the long haul. Certainly not for eternity. Listen: If I believe in anyone but the God revealed in Jesus, my belief--my faith--will be disappointed. I have put too much pressure on trembling human shoulders when I’ve placed my faith in them. And people have made the same mistake when reposing similar faith in me. We just can’t bear the weight of the need of every human being has for the one true God. Imperfect, sinful human beings can’t be God. As Paul also writes: “all have sinned and fall short of the glory of God” (Romans 3:23). This doesn’t mean that we should have nothing to do with others, I don’t believe. Quite the opposite. What it does mean is that we need to enlist the help of God in all of our relationships: marriages, friendships, churches, small groups so that, by the power of the Holy Spirit, we can become more trustworthy. We believe in God to help us be trustworthy. When we fail to be trustworthy, we must repent, seeking God’s forgiveness and the forgiveness of those we let down. When others fail to be trustworthy with us, we must forgive as we’ve been forgiven (Ephesians 4:32). This doesn’t mean that we should continue regular relationships with those who continually betray us. We can forgive others even when we realize that they’re chronically and unrepentantly--with repentance affirmed by a real life commitment to living differently--untrustworthy. To understand that no one is ultimately trustworthy isn’t to be cynical or resigned to a life of loneliness. It means that we love and accept others just as Christ loves and accepts us. We confront. We talk things through. We pray. But we place our ultimate trust in Jesus Christ alone. This is going to be tough today because Jesus presents us with tough words in our gospel lesson. But I promise if you will be patient and receptive to what Jesus has to say, discomfort will give way to joy. The God you and I know in Jesus Christ is, to use a term popular these days, inclusive in His love. By that, I mean, God loves all people. But the God we meet in Jesus is also exclusive in His standards. As Jesus Himself puts it, “not everyone who calls [Him], ‘Lord, Lord,’ will enter the kingdom of heaven” (Matthew 7:21). God loves us just as we are; but He loves us too much to leave us the way He finds us. God will welcome us, but He will not welcome our sins into His kingdom. He insists that we set them in His hands and leave them behind. And if you and I think that we are going to be part of God’s eternal kingdom while still clinging to our favorite sins, we are setting ourselves up for eternal regret. If following Jesus doesn’t make us fundamentally different people than we would be if we’d never heard of Jesus, we may not be following Jesus. For you and me, this is the message of the parable that Jesus tells in this morning’s gospel lesson, Matthew 22:1-14. It’s an important message. As has been true in our gospel lessons over the past several weeks, Jesus is still in the temple on the Monday after the first Palm Sunday, days before He would be arrested and murdered. As has also been true over these same weeks, Jesus once more tells a parable to the chief priests and elders who hate Him. Jesus has already made it plain that the chief priests’ and elders’ reliance on their goodness will mean nothing on the day when God judges every human being. All that will matter then, for them and for us, is whether we believe in the Messiah, Jesus, as our King, turning from sin and trusting in Him to give us life and make us fit for eternity. If we follow Jesus, we live; if we refuse to follow Jesus, we won't live. You all know enough about the wedding practices of first-century Judea to know that friends and family were informed that marriages had been arranged, but the invitations came later, on the spur of the moment. The groom and his party would arrive at the house of the bride and messengers were sent out to say, “The wedding will be in a few minutes. Come on.” You’d have to be ready with your wedding clothes at a moment’s notice. 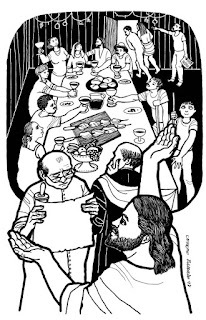 Here in the parable, the groom’s father, a king, representing God the Father, invites people to join in the wedding celebration and feast for his son, representing God the Son Jesus. 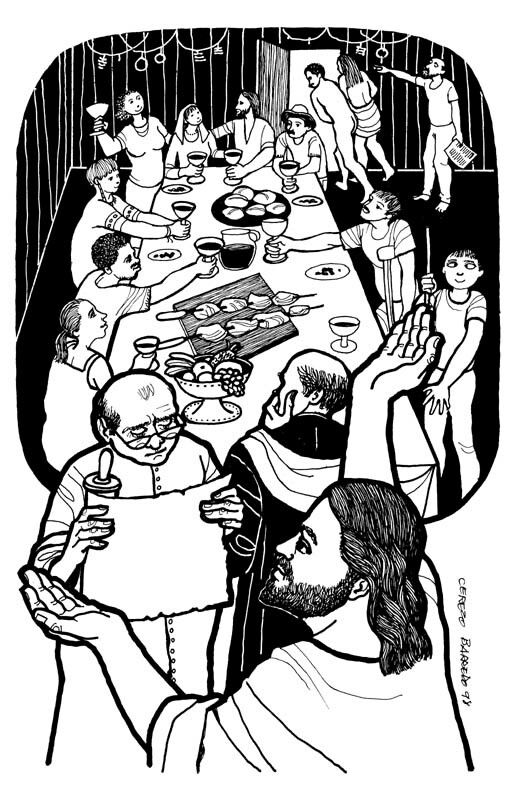 But in the parable, people refuse to come to the banquet. These are like the folks who view church membership as a "get out of hell free" card, but remain indifferent to the will of the Father or the Lordship of the Son. They’re too busy with their own agendas to be caught up in God’s agenda. And God’s agenda is clear: It’s to repent and believe in Jesus, not just as a ritual we go through on Sunday mornings. We are to turn from sin and trust in Jesus as God’s truth and the only way to live every single day. Are you and I listening to the Father’s invitation to the banquet everyday? Or are we doing our own things? God is patient. He spent centuries preparing His chosen people for the arrival of the Groom, Jesus. And He’s patient with Gentiles, the non-Jews: He’s given His Church centuries to share Jesus with others, to invite them to life with the Messiah Christ. God has prepared everything for those who turn from sin and follow Jesus. The invitation is inclusive. God wants everyone to say, "Yes!" to His invitation to eternal life. This, Jesus says, is how God’s prophets and preachers, including John the Baptist, were treated: with indifference, or roughed up, or killed off. Even the pious don’t like to have God telling them what to do. I know that I don't. The fact is that God’s truth, and His call and commands on our lives, can sometimes be tough for us to take. How do we react, for example, to God’s call and command that we love our neighbors as we love ourselves? As any parent knows, love isn't the same thing as approval. You still love your child even when you don't approve of the choices they sometimes make. So, how good are we at heeding God's command that we love the neighbors of whom we may or may not improve? Our Democratic or Republican neighbor. Not just in real life, but on Facebook and Twitter, when we’re watching TV. Every time we fail to love others as we love ourselves, effectively speaking or acting on the devil’s lie that we're God, judge, and jury over others, we walk away from God's love and from Christ and we drive another nail into His innocent flesh. Jesus’ first hearers included fellow Jews who wanted nothing to do with Him. They refused to welcome Him or acknowledge Him as God in the flesh, but were intent on killing Him. As soon as Jesus finished telling this parable, in fact, the chief priests and the elders of the temple began plotting how to get Him crucified. That's because Jesus is here signaling that even if His fellow Jews aren’t going to receive Him, the invitation to follow and belong to God for eternity is going out to everybody, including Gentile outsiders (the riff-raff) like you and me! Invite everyone, God is saying through Jesus. It’s why Jesus tells His Church: “make disciples of all nations” (Matthew 28:19) and “you will be my witnesses in Jerusalem, and in all Judea and Samaria, and to the ends of the earth” (Acts 1:8). Who are you and I inviting to Jesus’ kingdom these days? I’m not talking about who you’re inviting to worship or the programs of our church. I mean, who are you and I inviting among your neighbors and friends without a connection to Jesus to know Jesus, to follow Jesus? And are we intentionally seeking to strike up friendships with people who don’t follow Jesus so that you can have the privilege of inviting them to know Jesus? Are we cultivating your own relationship with Jesus so that, in Peter’s words, we’ll “be prepared to give an answer to everyone who asks [us] to give the reason for the hope that [we] have” through our relationship with Jesus, an answer to be offered “with gentleness and respect”? If we’re not doing these things--and I'm asking them of myself as much as I'm asking them of you--why not? God has prepared the banquet for everyone. Look, folks: This is not about wearing the right thing in the presence of God. As long as your attire is modest, God doesn’t care about the clothes you wear..at church or anywhere else. In our church in Cincinnati, a man and his wife in their sixties always sat with a young man in his thirties during worship. The two man always sat next to each other. Having met at church, they became good friends. The older man showed up every week in a three-piece suit, dressed to the nines. The young man often arrived on his motorcycle, sporting a do-rag, earrings, a three-day beard, a T-shirt, and torn jeans. They were as different as two people could possibly be. But they enjoyed worshiping together. They both realized that what's on the inside is vastly more important than what's on the outside! Personally, I’m happy to see people worship God whether they’re wearing jeans and flip-flops or three-piece suits. I'm sure that God is too! But nobody can enter the kingdom of heaven and be with God if they aren’t clothed in God’s righteousness, if their sins aren’t covered by the forgiveness and grace God gives to those who dare to turn from their own desires and submit entirely to the Lordship of Jesus and the will of God over their lives. Romans 13:14 tells us, “clothe yourselves with the Lord Jesus Christ, and do not think about how to gratify the desires of the flesh.” The proper attire for entrance into the kingdom of heaven is the righteousness that comes from faith in Jesus Christ! If we’re clothed in anything but the righteousness of God that comes to those who make repenting and believing in Jesus their daily lifestyle, we will be, in Jesus’ words, thrown outside in the darkness, weeping, gnashing our teeth, snarling eternal regret. That’s a daunting thought and it should remind us that faith in Christ isn’t like belonging to the Kiwanis or the Pinochle Club; it’s life and death business. Eternal life and death business. God’s love is inclusive. He loves the whole world. Everyone’s invited. But entrance into His kingdom is exclusive. It’s open to only those willing to be retrofitted for eternity by the grace He bears for all people through Jesus Christ. It’s open only to those willing to die to getting our own way and to live the life of God’s will be done. And when He calls you to lay aside a sin, jettison a sinful attitude, or befriend a fellow sinner, do it. Let Jesus lead your life and all of its decisions.